The story of the Prodigal Son is only told in the Gospel of Luke (painting: Nikolay Losev, 1882, Wikimedia Commons). Father Jeff Kirbyis a writer and priest in the diocese of Charleston, South Carolina. Fr. Kirby was recently recognized by Gov. Nikki Haley with the order of the Palmetto, South Carolina’s highest civilian award for his writing and vocations work. He is the author of several books, including Lord, Teach Us To Pray, and is the host of the national Christian formation program Doors of Mercy as well as the video course A Tour of St. Peter’s Square and Basilica. Father Kirby’s latest project is a DVD Bible study for Catholic scripture study that International and Saint Benedict Press called LUKE: The Gospel of Mercy. A study that was particularly relevant during the Year of Mercy, the project features teaching videos from Fr. Kirby shot on location in Rome and Assisi. I recently interviewed him by email about this project. What inspired you to create this Bible study? I was thrilled when I heard of Pope Francis’ decision to call an extraordinary jubilee year of mercy. In my own pastoral ministry, I saw the great need for a new emphasis on mercy and forgiveness. And so, the jubilee was both an inspiration and a challenge to me. I wanted to do whatever I could to help bring the message and grace of the mercy jubilee into parishes and Christian homes. Working on the Luke study with Dr. Paul Thigpen was one opportunity to help accomplish this goal. What is the message of the project? The message of the project is to show the tremendous love and mercy God has for each of us. Luke displays this in ways that the other Gospel writers did not. Perhaps it was Luke’s gentile background or because he most likely never met Jesus in this life and so all his knowledge of the Lord was given to him by others, but Luke reveals the compassion and gentleness of God in compelling ways. Just imagine, only Luke tells us the story of the Prodigal Son, the Good Samaritan and the Good Thief, to name just a few. The Luke study is for anyone! Christian believer, religious inquirer or skeptic. The program unveils the merciful heart of God for all humanity. Although the program is designed to be done in a group—whether a large community or a smaller group—it could also be done by a person at home or on the road. The title of your new Bible study refers to Luke as “the Gospel of Mercy.” What do you mean by that? While each of the Gospels show the mercy of God, Luke emphasizes this aspect of the Lord Jesus’ ministry in a radiant fashion. As a Gentile, Luke was not as concerned with showing Jesus as the fulfillment of Old Testament prophecy. Certainly, the Old Testament plays a role in Luke’s Gospel, but it’s not his primary focus. Since Luke does not have the Old Testament as the outline for his Gospel, he is able to focus on other portions of the Lord’s ministry. 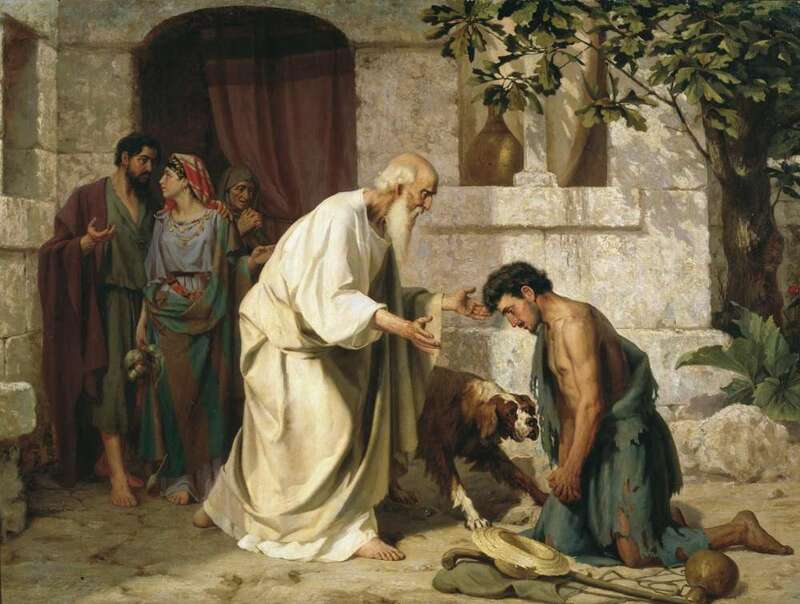 As a physician accustomed to the sufferings of humanity, Luke drew from his own experiences, highlighted the Lord as a kind of “divine physician” and stressed his tenderness, concern and kindness. Pope Francis has asked us to continue leading lives of mercy beyond the recently ended jubilee year. What does mercy mean to you? For me, mercy is about freedom from sin and darkness. It’s seeking to have this freedom myself while also giving others the same opportunity for this freedom. Mercy is the beginning of peace between myself and God, and between myself and my neighbor. If you could tell American Catholics one thing about the Gospel of Luke, what would it be? Luke encountered the Lord as we do, through witness and sacrament, and it changed his entire life and the focus of all his energies. Luke knew how much he was loved. I hope that each of us, through Luke’s Gospel, can come to a knowledge (or deeper knowledge) of God’s merciful and compassionate love for us. For a long time when I prayed, I used a type of Ignatian method, creating a composition of place about a biblical story, but now I tend to go almost in the exact opposite direction. I use a method of prayer called poustinia, which is a clearing of the mind of all images and concepts. It’s a deep resting in God, which helps me to encounter him as he desires to reveal himself. Who have been the biggest influences, living or dead, on your faith and work? Some of the greatest influences on my faith have been my parents, siblings, nieces and nephews, as well as the men of my faith household when I attended Franciscan University of Steubenville as a college student; and, several brother priests such as Fr. Kevin Walsh, Fr. David Carter and Fr. Greg Wilson. In terms of my work, I’ve been heavily influenced by our Southern Catholic writers, especially Walker Percy and Flannery O’Connor, as well as by St. Maximilian Kolbe, St. Josemaria Escriva, Pope St. John Paul II, Pope Emeritus Benedict XVI, Catherine Doherty, Charles Taylor, Cardinal Joseph Bernardin and a few other philosophers and scholars. I hope to write more on moral theology, especially placing several of our teachings within a broader biblical context. What regrets do you have about the past? One of the ongoing regrets of my life is the pressure between work and friends. I don’t like when the busyness of life and ministry eclipses time with family and friends, and it’s something I’ve been working to balance. My favorite Scripture passage is John 11:25 which reads in part: “I am the Resurrection and the Life.” For me this passage summarizes both our inheritance and our mission as Christian believers. We are sons and daughters of the Resurrection, and we are called to a life worthy of this dignity and upward calling in Jesus Christ. In terms of new projects, I have two floating prospects: to write a primer on biblical moral theology and compose a manual of prayer for medical professionals. If you could say one thing to Pope Francis, what would it be? Holy Father, thank you for your witness to mercy and the life that flows from it. You are an example to us of how to truly live the Works of Mercy. Please continue to show us the way. What do you want people to take away from your life and work? It’s my hope that people see in me and my work a sincere effort to live and share the life-saving message of Jesus Christ. From my work, whether on prayer, mercy or other topics, I pray people find an encouragement to thrive in the great hope and joy that God desires to give to all.